Many passages of the Book of Mormon are demonstrably dependent on the New Testament. The most obvious and sustained example of the use of the New Testament in the Book of Mormon comes in 3 Nephi 12–14, most of which is copied nearly verbatim from the Sermon on the Mount in Matthew 5–7 in the King James Version (KJV).1 However, there are many other interesting examples that are important because they demonstrate this textual dependence in other ways. In the case of the Sermon on the Mount, at least the Book of Mormon offers something of an explanation for the parallel, since it quotes Jesus as explaining that he was telling them what he had taught prior to his ascension (3 Nephi 15:1). That explanation doesn’t work, for a variety of reasons, but on a superficial level it might seem at least somewhat satisfying. In other places, however, the Book of Mormon’s use of the New Testament cannot be so explained. Perhaps the best place besides 3 Nephi 12–14 to see the use of the New Testament in the Book of Mormon is in the writings attributed to Moroni, especially Mormon 8–9 and Moroni 7–10. In this article, I will provide a simple overview of the evidence. In Part 2 I offer a rather thorough analysis of this evidence showing that the author of Moroni’s writings had and used the New Testament in the KJV. Subsequent articles in the series examine some of the examples in more detail. We should begin by setting the issue in the context of what the Book of Mormon itself claims about the writings of Moroni. According to the Book of Mormon, Moroni was the son of Mormon, the main author and compiler of a collection of prophetic writings inscribed on gold plates over a period of about a millennium, from the sixth century BC to the early fifth century AD. Mormon and Moroni were the last of the prophets of the Nephites, a once godly civilization living somewhere in the Americas that became corrupt and that was annihilated in the early fifth century AD by the Lamanites. Moroni took custody of the gold plates from his father and added some material before he died. This material consisted of some text appended to his father’s last, short book, also called the Book of Mormon (in Mormon 8–9), a book presenting an abridged account of a pre-Nephite civilization (which Mormons commonly call the Jaredites) from plates inscribed by the Jaredite prophet Ether, and Moroni’s own concluding little book entitled the Book of Moroni. That book is the last of fifteen books within what we know as the Book of Mormon. The Book of Mormon does not narrate what happened later, but according to Joseph Smith the prophet Moroni appeared to him in the 1820s as an angel and entrusted him temporarily with the gold plates. Joseph then produced an English translation, mostly if not entirely in 1829, which was published in 1830 as the Book of Mormon. In this study, although the Book of Ether is attributed to Moroni (as editor), our focus will be on the material in Mormon 8–9 and Moroni 7–10. 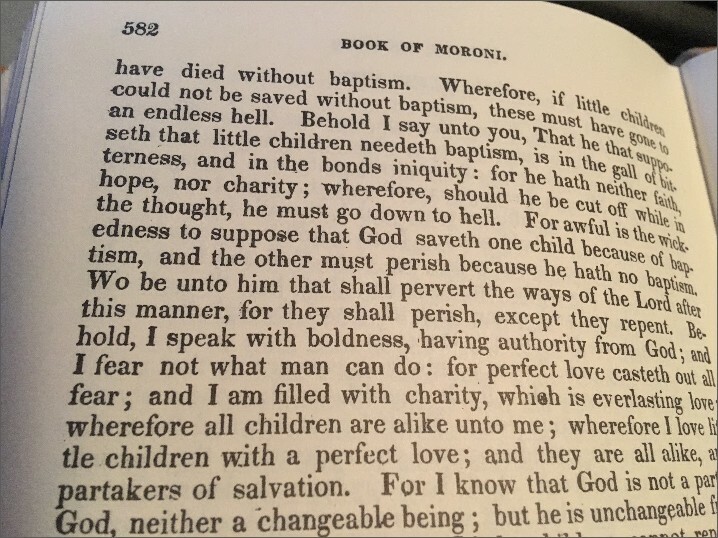 As explained above, Mormon 8–9 is Moroni’s addendum to the book after the death of his father Mormon. In this addendum, Moroni warns future readers of the corruption of the church and especially of widespread denial of the power of God to continue doing miracles among God’s people. We need to have some reasonably clear idea of what would count as a meaningful parallel between a passage in the New Testament and a passage in the Book of Mormon as a basis for identifying such parallels and considering their significance. The following criteria will be used in the course of this study. The proposed parallel cannot be an expression used by various writers due to its general nature. For example, the clause “I know not,” which occurs 21 times in the KJV (in eight books of the Old Testament and four books of the Testament) and 7 times in the Book of Mormon (e.g., Mormon 8:3, 5), by itself is not distinctive enough to be countable as a parallel to any specific text. This also applies to such expressions as “the commandment of the Lord” (Mormon 8:14). Such expressions could be part of more substantial parallels but will not count as meaningful parallels by themselves. The proposed parallel must express a meaningful idea or ideas at least comparable in both texts. To use an example from the Old Testament, the words “of which I have spoken” occur only once in the KJV Bible (Exod. 32:34), but none of the 14 occurrences of the same word string in the Book of Mormon uses it in anything like a comparable context or includes any additional indication of an allusion to the Exodus passage. Thus, it is unlikely that the phrase in its Book of Mormon occurrences derives from or is related in a literary way to Exodus 32:34. The proposed parallel to a New Testament passage cannot be adequately explained as deriving from the Old Testament. For example, the expression “the God of Abraham, and the God of Isaac, and the God of Jacob” (Mormon 9:11) is close enough to references in Exodus (3:6, 15-16; 4:5) that it cannot be clearly determined to have derived from the New Testament (even though it may well have done so).3 Similarly, the words “marvellous in our eyes” (Mormon 9:16) could come from Psalm 118:22, which is quoted in Matthew 21:42 and Mark 12:11. On the other hand, an Old Testament statement that is quoted in a distinctive wording in the New Testament counts as a parallel if the New Testament wording is found in the Book of Mormon. Thus, for example, “Vengeance is mine; I will repay” (Rom. 12:19) is a paraphrase of an Old Testament text (Deut. 32:41), but the wording is distinct enough that we should recognize Mormon 8:20 as a legitimate parallel to Romans 12:19. …for with that same judgment which ye judge, ye shall also be judged (Moroni 7:18). For with what judgment ye judge, ye shall be judged (Matt. 7:2). Any words in the immediate context of such a qualifying string of five or more words that also parallel the same New Testament passage may be included as part of the parallel. So in the above example, the words “for with” are included in the parallel. Word strings of five or more words may be counted as parallels if one or more of the apparently parallel words are simply different grammatical forms or are arranged in a different but synonymous syntax. For example, “is his grace sufficient for you” (Moroni 10:32) parallels “My grace is sufficient for thee” (2 Cor. 12:9): the word is simply stands in a different position in the clause, and the word pairs his/my and you/thee are merely different grammatical forms. Please note that identifying two passages as “parallel” does not mean, in and of itself, that one passage was derived from the other. In some cases literary dependence may seem obvious, at least to some people, and in some cases it may seem uncertain. The case for literary dependence is not based on the fact of verbal parallels alone. One ought to be able to recognize that Moroni 10:32 and 2 Corinthians 12:9 are verbally parallel in an interesting way even if one thinks or hopes that the parallel can be explained by some other hypothesis than literary dependence. So far we have laid a foundation for examining the issue of New Testament parallels in the writings attributed to Moroni. In setting forth the criteria we will be using we have identified four simple examples of such parallels. However, these are just a few of the many examples we will find—and some of them are far more significant, as we will see. In Mormon 8–9 and Moroni 7–10, we find four major, especially noteworthy passages that closely parallel passages in the New Testament. Here we will simply present the parallels and note briefly their similarities without discussing their significance. Go ye into all the world, and preach the Gospel to every creature; and he that believeth and is baptized, shall be saved, but he that believeth not, shall be damned. And these signs shall follow them that believe: In my name shall they cast out Devils; they shall speak with new tongues; they shall take up serpents; and if they drink any deadly thing, it shall not hurt them; they shall lay hands on the sick, and they shall recover (Mormon 9:22b-24). …for if he have not charity, he is nothing; wherefore he must needs have charity. wherefore, my beloved brethren, if ye have not charity, ye are nothing, for charity never faileth. Wherefore, cleave unto charity, which is the greatest of all, for all things must fail; but charity is the pure love of Christ, and it endureth forever; and whoso is found possessed of it at the last day, it shall be well with them. “Wherefore, my beloved brethren, pray unto the Father with all the energy of heart, that ye may be filled with this love which he hath bestowed upon all who are true followers of his Son Jesus Christ, that ye may become the sons of God, that when he shall appear, we shall be like him: for we shall see him as he is, that we may have this hope, that we may be purified even as he is pure” (7:48). “Behold, what manner of love the Father hath bestowed upon us, that we should be called the sons of God: therefore the world knoweth us not, because it knew him not. Beloved, now are we the sons of God, and it doth not yet appear what we shall be: but we know that, when he shall appear, we shall be like him; for we shall see him as he is. And every man that hath this hope in him purifieth himself, even as he is pure” (3:1-3). and they come from the same God. of divers kinds of tongues. of administrations, but the same Lord. the same God which worketh all in all. If any one of the above four passages in the books of Mormon and Moroni were an isolated occurrence of apparent textual dependence on the New Testament (and specifically on the KJV), one might dismiss the problem as an anomaly, a puzzle that does not necessarily prove what it seems to prove. But these are not isolated occurrences. What we have seen are four examples of lengthy verbal and conceptual parallels in the Book of Mormon to passages in three books found in three different parts of the New Testament—the Gospels, Paul’s epistles, and the general epistles (1 John 3:1-3). It is especially noteworthy that there are two sustained parallels to passages from adjacent chapters of 1 Corinthians (12:4-11 and 13:4-8a), occurring just four chapters apart in the Book of Mormon (Moroni 7 and 10).9 So many lengthy passages in Moroni’s writings closely paralleling different parts of the New Testament clearly appear to show that the author of those writings attributed to Moroni in fact had a New Testament. Did Moroni Have a New Testament? Although the major examples just presented are sufficient to establish beyond reasonable doubt that the writings attributed to Moroni are dependent on the New Testament, there is yet much more evidence supporting this same conclusion. There are numerous shorter examples of verbal dependence on the New Testament throughout Mormon 8–9 and Moroni 7–10, demonstrating a knowledge of the New Testament as a whole on the part of the author of these books. In what follows, we will simply quote the relevant lines of text from the Book of Mormon along with the New Testament texts from the KJV on which they are obviously dependent. Parallel words are shown in bold type in the Book of Mormon quotation; identical forms are also underlined. let him be aware lest he shall be in danger of hell fire (Mormon 8:17). whosoever shall say, Thou fool, shall be in danger of hell fire (Matt. 5:22). For judgment is mine, saith the Lord; and vengeance is mine also, and I will repay (Mormon 8:20). for it is written, Vengeance is mine; I will repay, saith the Lord (Rom. 12:19). in danger to be hewn down and cast into the fire (Mormon 8:21). …hewn down, and cast into the fire (Matt. 7:19; also Matt. 3:10; Luke 3:9). and there shall also be heard of wars, and rumors of wars, and earthquakes in diverse places (Mormon 8:30). And ye shall hear of wars and rumours of wars…and earthquakes, in divers places (Matt. 24:6-7). for they are in the gall of bitterness, and in the bonds of iniquity (Mormon 8:31). For I perceive that thou art in the gall of bitterness, and in the bond of iniquity (Acts 8:23). or can ye behold the Lamb of God (Mormon 9:3). Behold the Lamb of God (John 1:29, 36). and white, having been cleansed by the blood of the Lamb (Mormon 9:6). and made them white in the blood of the Lamb (Rev. 7:14). For do we not read that God is the same yesterday, to-day, and forever: and in him there is no variableness, neither shadow of changing (Mormon 9:9). Jesus Christ the same yesterday, and to day, and for ever (Heb. 13:8). with whom is no variableness, neither shadow of turning (James 1:17). they shall come forth, both small and great, and all shall stand before his bar (Mormon 9:13). And I saw the dead, small and great, stand before God (Rev. 20:12). that he that is filthy, shall be filthy still; and he that is righteous, shall be righteous still (Mormon 9:14). and he which is filthy, let him be filthy still: and he that is righteous, let him be righteous still (Rev. 22:11). ask not, that ye may consume it on your lusts (Mormon 9:28). Ye ask, and receive not, because ye ask amiss, that ye may consume itupon your lusts (James 4:3). For behold, it is not counted unto him for righteousness (Moroni 7:7). …and it was counted unto him for righteousness (Rom. 4:3). Whatsoever thing ye shall ask the Father in my name, which is good, in faith believing that ye shall receive, behold, it shall be done unto you (Moroni 7:26). And all things, whatsoever ye shall ask in prayer, believing, ye shall receive (Matt. 21:22). ye shall ask what ye will, and it shall be done unto you…. that whatsoever ye shall ask of the Father in my name, he may give it you (John 15:7, 16). I came into the world not to call the righteous, but sinners to repentance; the whole need no physician, but they that are sick (Moroni 8:8). …in the gall of bitterness, and in the bonds of iniquity (Moroni 8:14). …in the gall of bitterness, and in the bond of iniquity (Acts 8:23). Behold, I speak with boldness, having authority from God; and I fear not what man can do: for perfect love casteth out all fear (Moroni 8:16b). …that we may have boldness in the day of judgment: because as he is, so are we in this world. There is no fear in love; but perfect love casteth out fear (1 John 4:17-18a). …he [Christ] is the same yesterday, to-day, and forever (Moroni 10:19). …and love God with all your might, mind and strength, then is his grace sufficient for you, that by his grace ye may be perfect in Christ; and if by the grace of God ye are perfect in Christ, ye can in no wise deny the power of God (Moroni 10:32). My grace is sufficient for thee: for my strength is made perfect in weakness. Most gladly therefore will I rather glory in my infirmities, that the power of Christ may rest upon me (2 Cor. 12:9). Here we have 21 different places in Moroni 8–9 and Mormon 7–10, in addition to the four extended instances we saw earlier, that contain clear, substantial verbal parallels with texts in the New Testament, using wording to varying extents identical to what is found in the KJV. In two of these places there are parallels to two different New Testament texts (Mormon 9:9, cf. Heb. 13:8; James 1:17; Moroni 7:26, cf. Matt. 21:22; John 15:7, 16). There are also two New Testament texts that are paralleled twice in the Moroni texts (Acts 8:23, see Mormon 8:31; Moroni 8:14; Heb. 13:8, see Mormon 9:9; Moroni 10:19). Counting the four major parallels noted previously, then, there are 25 texts in Mormon 8–9 and Moroni 7–10 containing parallels to 25 different texts in 12 different books of the New Testament: Matthew, Mark, John, Acts, Romans, 1 Corinthians, 2 Corinthians, Philippians, Hebrews, James, 2 Peter, 1 John, and Revelation. To put it another way, the parallels involve passages in the Gospels, Acts, Paul’s epistles, the general epistles, and Revelation—every part of the New Testament. In most of these instances, it is not necessary to suppose that the author of the Book of Mormon had a KJV Bible in his hands while he was producing the text of Mormon 8–9. Many people in the early nineteenth century were intimately familiar with the Bible and could quote numerous lines from it by memory just as easily as people today can recite lines from their favorite movies. It is even possible to account for Mormon 9:22b-24 in this way, although it is reasonable to guess that at this point in the proceedings the author consulted a KJV (despite the claims of a few of Joseph’s associates decades later that he never did so). In any case, whoever wrote Mormon 8–9 clearly had a New Testament—specifically the New Testament in the King James Version of the Bible. A careful analysis of the evidence will prove this conclusion beyond reasonable dispute, as we shall seek to show in part 2 of this series. 1. This is the subject of my dissertation, “The Sermon at the Temple in the Book of Mormon: A Critical Examination of Its Authenticity through a Comparison with the Sermon on the Mount in the Gospel of Matthew,” Ph.D. diss. (South Africa Theological Seminary, 2014). 2. The chapter divisions in the Book of Moroni, unlike other books of the Book of Mormon, are the same in the 1830 edition as in current editions. 3. The precise wording of this expression in Mormon 9:11 is found in several New Testament passages in the KJV (Matt. 22:32; Mark 12:26; Luke 20:37; Acts 7:32). The Exodus texts have the same wording in the KJV except that they lack the word and before “the God of Isaac.” Although it is plausible to think that the form in Mormon 9:11 was influenced by the New Testament texts, the difference is too picayune to base any conclusions on it. 4. It might be worth noting that such breaks must be short (generally no more than a few words) and the parallel elements clearly part of the same short unit of text for the parallel to be accepted as legitimate and meaningful. Finding the words “ye judge” and “ye shall be judged” in two different chapters or separated by hundreds of words would obviously not constitute a genuine parallel to Matthew 7:2. 5. The forthcoming article will discuss the textual question about the Long Ending (Mark 16:9-20), which nearly all biblical scholars think was added to the Gospel later. However, the parallel is extremely significant whether or not one regards the Long Ending as part of the original Gospel of Mark. 6. A later article in this series will discuss in detail the use of 1 Corinthians 13 in the Book of Mormon. 8. There are further reasons to consider this parallel to 1 Corinthians 12 especially telling that will be explained in a later article in this series. 9. To be more precise, about 2,500 words separate the two passages in Moroni 7:44-47 and 10:8-17.